Robert Alford (born November 1, 1988) is an American football cornerback for the Arizona Cardinals of the National Football League (NFL). He played college football at Southeastern Louisiana, and was drafted by the Atlanta Falcons in the second round of the 2013 NFL Draft. Alford was born in Hammond, Louisiana. He attended Hammond High Magnet School and played high school football and ran track for the Hammond Tornadoes. He was a first-team all-District 7-5A selection at wide receiver, catching 10 touchdown passes as a senior for the Tors. He was chosen as the Tors’ Rookie of the Year as a sophomore. In addition to football, Alford was on the Tornadoes' track & field team, where he competed as a sprinter and jumper. He finished second in the 400-meter dash at the 2007 LHSAA Track and Field Championships, with a time of 49.62 seconds. At the 2008 Region II-5A Championships, he won both the 400 meters, recording a career-best time of 48.68 seconds, and the long jump, setting a personal-best mark of 7.09 meters. Alford enrolled in Southeastern Louisiana University, where he played for the Southeastern Louisiana Lions football team from 2008 to 2012. After redshirting in 2008, he started nine of the 10 games in 2009, appearing in at cornerback and finished the season with 46 tackles (35 solo), and was also second on the team with five pass breakups. He was granted a medical redshirt after missing the 2010 season with an injury. He returned in 2011 and was named second team All-Southland Conference after establishing himself as one of the conference's elite cornerbacks. He started all 11 games for the Lions, and finished second in the Southland with five interceptions and fourth in the league with seven pass breakups. He finished the year with 52 tackles (45 solo), and his five interceptions was the eighth-highest single-season total in school history. In his final season, he was named first team All-Southland conference after finishing the year with 39 tackles (35 solo), including five for loss, four interceptions and eight pass break ups. On November 21, 2012, it was announced that Alford had accepted his invitation to play in the 2013 Senior Bowl. He became the second player from Southeastern Louisiana to play in the Senior Bowl and the first since Ronnie Hornsby in 1979. On January 26, 2013, Alford recorded five combined tackles and an interception to help Detroit Lions' head coach Jim Schwartz's South team that defeated the North 21-16. Alford had an impressive performance that also included an 88-yard kickoff return to start the game and immensely raised his draft stock. He was one of 60 collegiate defensive backs and 35 cornerbacks to attend the NFL Scouting Combine in Indianapolis, Indiana. Alford performed all of the combine drills and finished fourth among all defensive backs in the 40-yard dash. On March 26, 2013, Alford attended Southeastern Louisiana's pro day, but opted to stand on his combine numbers and only performed positional drills as team representatives and scouts from 15 NFL teams attended. At the conclusion of the pre-draft process, Alford was projected to be a second or third round pick by NFL draft experts and scouts. He was ranked the 10th best cornerback prospect by NFL analyst Mike Mayock and the 11th best cornerback by NFLDraftScout.com. The Atlanta Falcons selected Alford in the second round (60th overall) of the 2013 NFL Draft. The Atlanta Falcons also drafted Washington's Desmond Trufant in the first round (22nd overall). He was the first player drafted from Southeastern Louisiana since Brett Wright in 1984. Alford also became the second highest selection in Southeastern Louisiana's school history, behind only Calvin Favron who was selected in the second round (46th overall) of the 1979 NFL Draft. On June 14, 2013, the Atlanta Falcons signed Alford to a four-year, $3.40 million contract that includes $1.07 million guaranteed and a signing bonus of $853,744. Throughout training camp, he competed for a starting cornerback job against Asante Samuel, Desmond Trufant, and Robert McClain. Head coach Mike Smith named him the third cornerback on the Falcons' depth chart, behind Samuel and Trufant. He made his professional regular season debut in the Atlanta Falcons' season-opener at the New Orleans Saints and recorded one tackle, two pass deflections, and intercepted the first pass of his career during their 23–17 loss. He made his first career interception off a pass attempt by quarterback Drew Brees that was intended for receiver Marques Colston at the end of the third quarter. On November 3, 2013, Alford recorded two combined tackles, deflected a pass, and intercepted a pass by Cam Newton in the Falcons' 34–10 loss at the Carolina Panthers. After posting a 10-3 season, head coach Mike Smith elected to start Alford at cornerback over Asante Samuel for their Week 14 matchup against the Green Bay Packers. He made his first career start and recorded five combined tackles and deflected a pass during their 22–21 loss. The following week, Alford collected a season-high nine combined tackles in Atlanta's 27-26 victory over the Washington Redskins. He played in all 16 games with four starts as a rookie finishing with 40 combined tackles (28 solo), nine pass deflections, two interceptions, and one forced fumble. Alford entered the 2014 season slated as the starting cornerback alongside Desmond Trufant. On October 19, 2014, Alford recorded two solo tackles, defended two passes, and intercepted Baltimore Ravens' quarterback Joe Flacco twice during a 29–7 loss. During a Week 10 matchup at the Tampa Bay Buccaneers, he collected a season-high nine combined tackles in a 27-17 victory. The following week, Alford made one tackle before leaving a 19–17 win against the Carolina Panthers with a broken wrist. On December 14, 2014, the Atlanta Falcons placed him on injured reserve after it he underwent surgery and it became apparent he wouldn't be able to return during the 2014 season. He finished the season with 36 combined tackles, three interceptions, and 11 pass deflections in ten games and ten starts. Throughout his first training camp under new head coach Dan Quinn, Alford competed to maintain his role as starting cornerback against Akeem King, rookie Jalen Collins, and Phillip Adams. He was named the starting cornerback, opposite Desmond Trufant, to start the regular season. 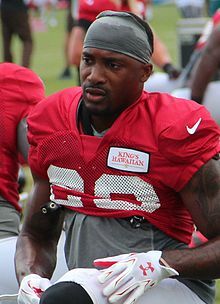 On October 11, 2015, Alford recorded one tackle, two pass deflections, intercepted Washington Redskins' quarterback Kirk Cousins twice, and returned one for a touchdown during the Falcons' 25–19 victory. He intercepted Cousin's pass on the last play of the game and returned it for a 59-yard game-winning touchdown, marking the first touchdown and pick six of his career. Alford missed the Falcons' Week 9 matchup against the San Francisco 49ers after suffering a groin injury. In Week 17, he collected a season-high eight solo tackles in the Falcons' 20–17 loss to the New Orleans Saints. He completed the 2015 season with a total of 53 combined tackles (45 solo), 15 passes defensed and two interceptions, and a touchdown in 15 games and 15 starts. Head coach Dan Quinn named Alford and Desmond Trufant the Falcons' starting cornerback duo to start the regular season. He started the Atlanta Falcons' season-opener against the Tampa Bay Buccaneers and made five combined tackles and deflected two passes during their 31–24 loss. In Week 3, he collected a season-high eight combined tackles and deflected a pass in Atlanta's 45-32 win against the New Orleans Saints. On October 2, 2016, Alford recorded three solo tackles, defended three passes, intercepted two passes, and returned one for a touchdown in the Falcons' 48–33 victory over the Carolina Panthers. He returned his second interception off Cam Newton for a 30-yard touchdown, marking the second pick-six of his career. Alford finished the 2016 season with 61 combined tackles (50 solo), 19 pass deflections, two interceptions, and a touchdown in 16 games and 16 starts. On December 8, 2016, the Atlanta Falcons signed Alford to a four-year, $38 million contract extension that includes $12 million guaranteed and a signing bonus of $3 million. The Atlanta Falcons finished first atop the NFC South with an 11-5 record and received a playoff berth. On January 14, 2017, Alford started his first career playoff game and recorded five solo tackles in the Falcons' 36–20 victory over the Seattle Seahawks in the NFC Divisional Round. The Atlanta Falcons went on to defeat the Green Bay Packers in the NFC Championship 44–21 and went on to Super Bowl LI. On February 5, 2017, Alford recorded 11 combined tackles, an interception, fumble recovery, and touchdown as the Falcons lost to the New England Patriots 34–28 in overtime. His touchdown came off an 82-yard return after intercepting quarterback Tom Brady in the second quarter. Alford was named the starting cornerback, along with Desmond Trufant, for the fourth consecutive season. On November 20, 2017, Alford recorded a career-high ten combined tackles and deflected three passes in a 34–31 victory at the Seattle Seahawks. On December 31, 2017, he collected two solo tackles, made a career-high four pass deflections, and intercepted a pass attempt by Cam Newton during their 22–10 victory. Alford finished the 2017 season with a career-high 68 combined tackles (60 solo), a career-high 20 pass deflections, and an interception in 16 games and 16 starts. Alford returned in 2018 as a starting cornerback alongside Desmond Trufant. He started 15 games, finishing with 50 combined tackles and was second on the team with 11 passes defensed. On February 5, 2019, Alford was released by the Falcons after six seasons. On February 7, 2019, Alford signed a three-year, $22.5 million contract with the Arizona Cardinals. His brother, Fred Booker, played in the NFL for the New Orleans Saints in the 2005 season. ^ Mike Inabinnett (November 21, 2012). "Southeastern Louisiana's Robert Alford coming to Senior Bowl (video)". AL.com. Retrieved December 31, 2017. ^ Thomas Galicia (January 26, 2013). "The 5 Biggest Revelations from 2013 Senior Bowl". BleacherReport.com. Retrieved December 31, 2017. ^ "2013 NFL Combine Results: Defensive Backs". SteelersDepot.com. Retrieved December 31, 2017. ^ Louis Bien (March 26, 2013). "NFL Draft 2013: Cornerback Robert Alford among hottest names". SBNation.com. Retrieved December 31, 2017. ^ "Robert Alford, DS #11 CB, Southeastern Louisiana". nfldraftscout.com. Retrieved December 31, 2017. ^ Mike Mayock (April 19, 2013). "2013 NFL Draft: Mike Mayock's top 100 prospects". NFL.com. Retrieved December 31, 2017. ^ "NFL Draft Profile: Robert Alford". NFL.com. Retrieved December 31, 2017. ^ "2013 NFL Draft Listing". Pro-Football-Reference.com. Retrieved December 26, 2017. ^ "Pro-Football Reference: Robert Alford". pro-football-reference.com. Retrieved December 31, 2017. ^ a b "Spotrac.com: Robert Alford contract". Spotrac.com. Retrieved December 31, 2017. ^ "Ourlads.com: Atlanta Falcons' depth chart: 09/05/2013". Ourlads.com. Retrieved December 31, 2017. ^ "NFL Game Center: Week 1-2013: Atlanta Falcons @ New Orleans Saints". NFL.com. Retrieved December 31, 2017. ^ Kenneth Arthur (December 11, 2013). "Asante Samuel uncertain of future with Falcons". SBNation.com. Retrieved January 1, 2018. ^ "NFL Player stats: Robert Alford (2013)". NFL.com. Retrieved January 1, 2018. ^ "Robert Alford 2013 Game Log". Pro-Football-Reference.com. Retrieved December 26, 2017. ^ "Robert Alford Stats". Pro-Football-Reference.com. Retrieved December 26, 2017. ^ "NFL Player stats: Robert Alford (2014)". NFL.com. Retrieved January 1, 2018. ^ "Robert Alford Injury: Updates on Falcons CB's Wrist and Return". BleacherReport.com. Retrieved January 1, 2018. ^ "Falcons CB Robert Alford needs wrist surgery, placed on injured reserve". si.com. December 15, 2014. Retrieved January 1, 2018. ^ Adams, Jay (December 8, 2016). "Falcons Place CB Alford on Injured Reserve". AtlantaFalcons.com. ^ "Robert Alford 2014 Game Log". Pro-Football-Reference.com. Retrieved December 26, 2017. ^ "Ourlads.com: Atlanta Falcons' depth chart: 10/01/2015". Ourlads.com. Retrieved January 1, 2018. ^ "NFL Game Center: Week 5-2015: Washington Redskins @ Atlanta Falcons". NFL.com. Retrieved January 1, 2018. ^ David Fucillo (November 4, 2015). "49ers-Falcons injury report: Running backs sitting, special teamers out". ninersnation.com. Retrieved January 1, 2018. ^ "NFL Player stats: Robert Alford (2015)". NFL.com. Retrieved January 1, 2018. ^ "Robert Alford 2015 Game Log". Pro-Football-Reference.com. Retrieved December 26, 2017. ^ "Washington Redskins at Atlanta Falcons - October 11th, 2015". Pro-Football-Reference.com. Retrieved December 26, 2017. ^ "Carolina Panthers at Atlanta Falcons - October 2nd, 2016". Pro-Football-Reference.com. Retrieved December 26, 2017. ^ "NFL Game Center: Week 4-2016: Carolina Panthers @ Atlanta Falcons". NFL.com. Retrieved January 2, 2018. ^ "Robert Alford 2016 Game Log". Pro-Football-Reference.com. Retrieved December 26, 2017. ^ Jackson, Curtis (December 8, 2016). "Falcons Announce Contract Extension with CB Alford". AtlantaFalcons.com. ^ Patra, Kevin (December 8, 2016). "Falcons sign Alford to 4-year extension, worth $38M". NFL.com. ^ "NFL Game Center: Post 22-2016: New England Patriots @ Atlanta Falcons". NFL.com. Retrieved January 2, 2018. ^ a b "Super Bowl LI - New England Patriots vs. Atlanta Falcons - February 5th, 2017". Pro-Football-Reference.com. Retrieved August 6, 2017. ^ Martinez, Jose (February 5, 2017). "Falcons' Robert Alford Picks Off Tom Brady, Returns It for a Touchdown". complex.com. ^ "NFL Player stats: Robert Alford (2017)". NFL.com. Retrieved January 2, 2018. ^ Shook, Nick (February 5, 2019). "Falcons releasing Robert Alford after six seasons". NFL.com. ^ Bergman, Jeremy (February 7, 2019). "Cardinals sign CB Robert Alford to three-year deal". NFL.com.